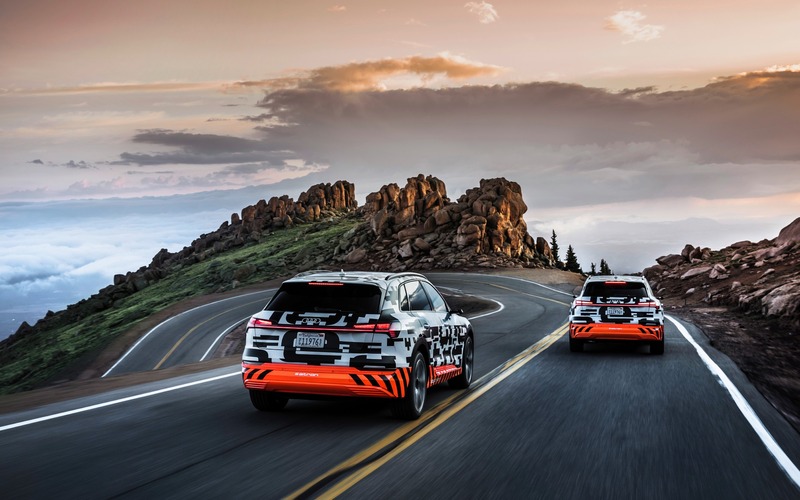 Every new vehicle undergoes a wide array of tests before it hits the market and the upcoming Audi e-tron, the brand’s first all-electric SUV, has just delivered an impressive performance at Pikes Peak—only instead of climbing up the famous Colorado mountain, it spent time going downhill. Audi says the e-tron will travel more than 400 kilometres on a full charge, but it also uses an energy recuperation system that is variable and thus the most efficient among all the competitors. On its 31-km downhill drive, the electric SUV fed so much energy back to the battery that it could cover approximately the same distance again. In other words, each kilometre downhill brought around an additional kilometre in range. Of course, the difference in altitude of about 1900 metres provided the necessary conditions for this incredible feat. Overall, the Audi e-tron’s recuperation system contributes to up to 30 percent of its range. It involves both the two electric motors and the electrohydraulically integrated brake control system. For the first time, three different recuperation modes are combined: manual coasting recuperation using the shift paddles, automatic coasting recuperation via the predictive efficiency assist, and brake recuperation with smooth transition between electric and hydraulic deceleration. For over 90 percent of all decelerations, the conventional brakes are not required, making one-pedal driving possible. They are involved only when the driver slows down by more than 0.3 g using the brake pedal. Audi says they respond extremely quickly thanks to a new electrohydraulic actuation concept: only 150 milliseconds separate the initiation of the deceleration and the presence of maximum brake pressure between the pads and discs. Consequently, braking distances are shortened by up to 20 percent compared with a conventional brake system. Oh, and in case you’re wondering: the Audi e-tron is pretty good at accelerating, too, with less than six seconds to go from 0 to 100 km/h and a top speed electronically limited at 200 km/h. A boost mode increases power from 355 to 402 hp and torque from 414 to 490 lb.-ft. for eight seconds. The production version of the all-new Audi e-tron will make its global debut on September 17 in San Francisco.Full specifications, including U.S. pricing, will be available at that time. Details for the Canadian market will be announced later.